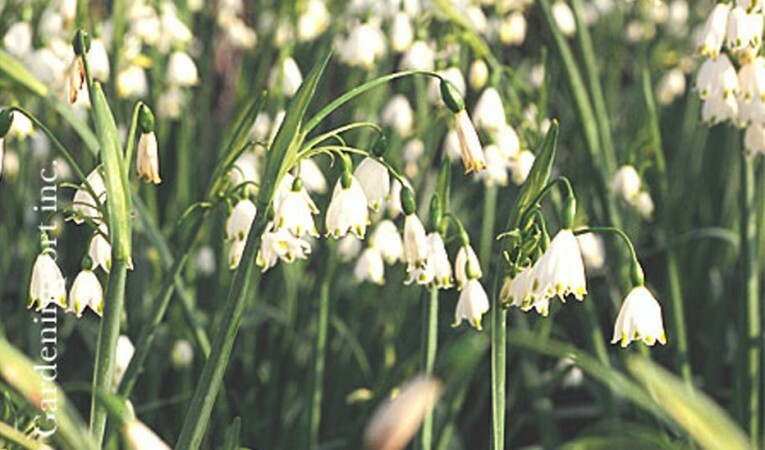 This month, I’m featuring two different bulbs—singing the praises of one that has just finished its spectacular flowering, and offering a tip about another that is probably growing indoors in many households and just getting ready to flower. These are fall-flowering South African members of the large Amaryllis family, with a total of 30 species. They bloom in shades of white, pink and magenta. Nerine bowdenii is the most common type but some nurseries offer the selected form Pink Triumph. Most Nerine are around 38 to 56 centimetres (15 to 22 inches) tall with six or more four-to-five inch flowers per stem. 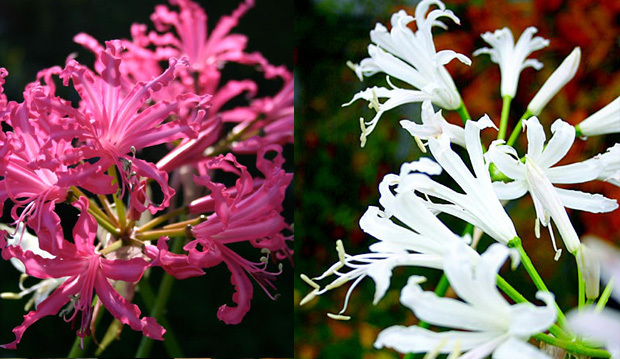 Because the weather is cooler in the late summer and fall, Nerine flowers can last for two weeks with individual buds seldom opening simultaneously. Its bulbs somewhat resemble a narcissus’, but are only three to four inches in diameter. These bulbs are not hardy to overwinter outdoors in Toronto, so it’s best to grow them in pots, which is a style of gardening I’ll write more about soon. I plant five bulbs to an eight-inch pot, barely covered by a fertile-but-gritty, sharply draining soil. Nerine leafs out in the spring and likes moderate water, frequent feeding with a high potassium count fertilizer, and a hot, sunny spot outdoors. Its foliage dies back in the summer when you can stop feeding and cut down a bit on watering. Flower buds appear in late summer when most other bulbs are finished–except our good friends Colchicum and autumn-flowering Crocus. The leafless stems grow slowly with the tapered buds opening once the stems have reached their full height. After they finish flowering, cut off the stems at soil level and store the pots indoors in a place that’s dry, dark and as cool as can be without freezing. Nerines resent being disturbed so when spring returns, just give them a drink, put them outside, and watch them grow! I have no idea why more gardeners don’t grow Nerine, which are such an undiscovered wonder for lazy gardeners. Yes, that’s right–they thrive on the lavish neglect I’ve been giving them for years. I’m trialing several varieties this year and for some unknown reason they’re blooming late. I brought them indoors when frosts threatened and now have a dining room table filled with six pots in various stages of bloom. She sports snow-white, crinkly flowers in abundance. This isn’t the best photo but I hope to get a better shot when she comes into bloom in the next week or so. N. Bianca Perla normally blooms in September but is extraordinarily late this year. She was my first Nerine and although I’ve grown many since, she is still the largest-flowered light pink type and a personal favourite. Wow! People are always impressed by these electric, magenta-pink, ruffled and recurved flowers! She won me “best in show” at the Greater Toronto Bulb meeting last year. Tired of your paperwhite narcissus growing tall and lanky and falling over? Just give them a drink; they’ll stay shorter and bloom beautifully. Like many of my friends, paperwhites will drink almost anything provided it’s a four-to-six per cent solution (one part booze to seven parts water), although no beer or wine, please. Cheers! Dugald Cameron is co-founder and president of Gardenimport, the premier mail order nursery in Canada.